There is a light that plays along the Black Mountains of Western North Carolina. It inspires a rich culture of glass artists along the Toe River. Dotting the landscape from Spruce Pine to Burnsville, many of them have become nationally and internationally renowned. Yet the wildness remains in them and in their work. They came here as students or teachers at the Penland School of Crafts—expecting to stay a short while but instead founded an abiding legacy. 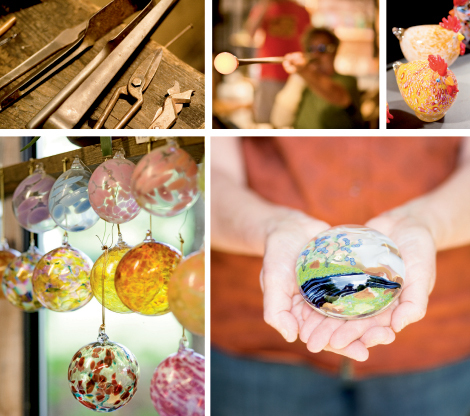 It doesn’t hurt to have one of the top glass-blowing schools on the East Coast, either. For decades, Penland School of Crafts has attracted artists to learn and share ideas. Some have moved on after their studies, but others, like Billy, chose to stay, developing their craft and a tight-knit community around the school. Peiser’s work has been purchased by many museums and galleries, including the Smithsonian Institution and museums in Denmark, Japan, and Switzerland. His techniques, such as the creation of the four-pot furnace, have changed how thousands of artists develop their own works. He began in a place quite different from the technologically brilliant, state-of-the-art studio that he has now. Peiser had been an industrial designer in Chicago, but fell in love with this area, and, after only three days of classes, soon persuaded Penland director Bill Brown to let him become the school’s first resident artist specializing in glass. The bubble never burst, and Peiser’s career took off when his glass paperweights became popular—what would be the first among many series in a career spanning four decades. And even though many traditions in this art have been carefully guarded secrets for thousands of years, Peiser and Billy decided to found the Glass Art Society so they could develop their artistry together. In 1971, twenty-five artists got together to swap stories and ideas. That congenial gathering has grown into an international organization with thousands of members, and annual conferences as far away as Australia and the Netherlands. Many of the glass artists have followed a similar path, learning from the challenges, creating special tools to shape the molten material in a way that expresses their perceptions and imaginings. Some of them toil alone, and others work together. Billy and his wife, Katherine, started a studio in the South Toe River Valley. Katherine has been painting on glass ever since former Penland teacher Harvey Littleton—another Spruce Pine transplant and one of the country’s foremost authorities on studio glass—suggested she give it a try. She and Billy work in tandem—melting and spinning. The bright flames intensify and the liquid glass quivers as if it were alive. The glassblower whispers deep breaths into a long tube, and the symmetry emerges. As he rolls the rod back and forth, Billy holds a wet, wadded newspaper in his hand to shape the glowing bubble. And soon a whimsical goblet emerges. The Bernsteins have raised their family in the South Toe River Valley. One son is a doctor and the other has become a glass artist in Asheville. Many artists who came for a class or a visit have started their own multigenerational legacies. Rob Levin came to Penland for a clay class and tried glass blowing on a whim. That whim became his life’s work for decades. Like the Bernsteins, he and his wife of 40 years, Wanda, raised their children here. He became enchanted with Appalachian music, and is also a noted musician—just like one of his twin daughters, Hannah. 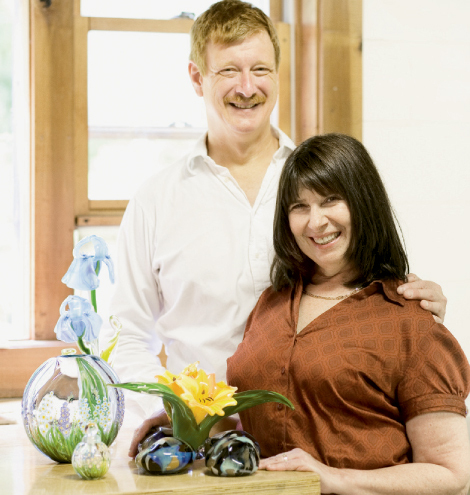 Contentment characterizes the lives of Yaffa and Jeff Todd, too, who came here as the next generation of glass artists. Jeff first came to Penland as a youngster with his mother, fiber artist Louise Todd Coe, who taught classes here. He later met Yaffa, who had started as a graduate assistant to Peiser, and later decided to start her own workshop. Yaffa, like Levin and other glass artists, makes her own colors from secret blends. She still uses the chemical recipe for glass that she created while working with Peiser. The recipes might be the same, but having a family changed the artists’ work. They wanted to be able to leave the studio when school ended so they could spend time as a family. “We used to do large pieces, with 14 hours of hot work together, but with kids, we had to do things in stages so we could stop and be with them,” Jeff says. They develop ideas by creating together. The artists all agree that inspiration naturally emanates from their surroundings, the brilliant colors of the autumn leaves and the bright greens of spring. But what shapes that glass is skill and imagination, two attributes that move to and from the Penland School—the center of this community. Having been drawn here so long ago to learn, they’ve found the livelihoods they were seeking.